Ho Kim, President and CEO of local tech company CAMACC and volunteer chair of VIATeC’s board of directors, named Ernst and Young’s 2014 Entrepreneur of the Year in the Information Technology category for Canada’s Pacific region. This November, Victoria’s Desert Bus team smashed a record, and they did it all with a bit of song and dance, a lot of social media savvy, and a preternatural ability to withstand punishing amounts of tedium. Helping create new technology entrepreneurs and high-growth businesses is Erin’s passion. With this in mind, she helped encouraged Ladies Learning Code (LLC) to launch in Victoria. LLC is a Canada-wide not-for-profit group that is working to empower everyone to feel comfortable learning beginner-friendly technical skills in a social, collaborative way. It’s hard to believe TinyMob, led by Tectorians Chris Hoefgen, Alex Mendelev and Jamie Toghill, opened their Langley Street studio just over a year ago after quickly raising a whopping $2 million in seed funding. And that was just the start of their success. Pretio, the first graduate of VIATeC’s Accelerator Program, acquired the 2012 VIATeC Award Recipient for Online Strategy of the Year, Tap for Tap. “When I thought about life in Victoria, I knew I would be getting healthier and happier,” Kiind’s Graham Baradoy writes on his excellent blog. But since settling here Graham has also become a leader and driving force in our community of Tectorians. The 756 attendees wasn’t the only record broken at the sold-out 2014 VIATeC Technology Awards. This year there was also a record number of 100 nominations. It was an amazing night. The numbers came in and we were astounded by the results. We were also startled by the year-over-year growth of the 25 highest revenue tech companies headquartered on Vancouver Island. These 25 companies generate $1.16 billion in combined revenues and employee an astounding 3,630 employees. Warren Brown and the team at Procura together represent the potential of Victoria’s tech community, and show where we’ve been and where we’re going. And that’s it for 2014! What a year! And 2015 looks like it’s only going to be better! Clayton Lainsbury, founder and CEO of Victoria’s Crowd Content, is our Tectorian of the Week. After making the move with us to Fort Tectoria this past fall, VIATeC Accelerator program participant Crowd Content has grown so much they need new digs. The startup company has just moved out from Fort Tectoria, but we’re not too sad – Clayton and his expanding team have found new digs just across the street. Clayton and his team at Crowd Content make it easier for businesses to easily work with top writers in order to create higher quality, more engaging content to help them sell online. There are so many successful tech companies in Victoria that it’s often difficult to remember that success is no sure thing. 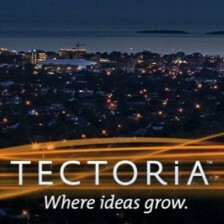 Each and every one of the technology companies that directly employ 15,000 people in Victoria started out as an idea. And it took a lot of hard work, perseverance, smarts and teamwork to achieve success. A Royal Roads grad, Clayton joined the Accelerator program in 2012. He’s one of a number of talented, visionary Neverblue alumni that are helping Victoria gain recognition as a hub for e-commerce and web marketing. Thanks to people like Clayton, Victoria has become well-known name in the marketing community everywhere from New York to Boulder to San Francisco. Clayton has grown his startup to ten employees, with plans to hire more – Crowd Content is currently looking for developers and account managers. It takes drive, commitment and leadership skills to build a successful technology company in Victoria, which is why Clayton Lainsbury is our Tectorian of the Week. Is Your Work Area a Pain In The Neck? Sitting in front of a computer monitor or laptop for long periods of time is associated with numerous health problems, ranging from weight gain, to cardiovascular disease to a shortening of your life expectancy. Other symptoms include fatigue, headaches, arthritis, increases blood pressure, risk of fracture, and neck and back pain. Below are some tips that will help you to stay injury free and energetic throughout your work day. Sit as close as possible to your desk, with your upper arms parallel to your spine and your hands and forearms rested on the work surface. If your arms are not supported, the muscles of your neck and shoulders will try to compensate and you will end up with shorten tight muscles. Make sure your elbows are at a 90-degree angle, and your legs are bent at the knees at a 90 degree angle. Adjust your chair higher or lower to achieve the 90-degree angles. If you have to lift your feet off the ground because of a chair or a desk that is too high, use a footstool to prop and rest your feet at the 90 degree angle. Chair depth refers to the length between the back edge and front edge of your chair. To check for proper chair depth, sit all the way back in your chair so that your back is fully supported by the backrest and check the room between the front edge of your chair and your calves by making a fist and bringing it to the edge of the chair and pushing it on the calf. If you can’t fit your fist between the front edge of the chair and your calf, your chair is likely too deep, which will decrease your circulation. Moving the chair’s backrest forward or inserting a cushion to support your lower back, should solve this problem. Low back support is essential in preventing slouching and reducing back pain. Poor typing posture, either from improper seating arrangements or tight muscles, can lead to sore hands, fingers and carpal tunnel syndrome. Remember to use minimum force when typing on the keyboard, and place the keyboard directly in front of the monitor. Take each hand, one at a time and place all five finger tips together. Slip a wide rubber band ( the rubber bands that hold the broccoli stalks together in the grocery store are perfect) around all five fingers and draw them apart against the resistance of the band, this will help reduce and strengthen your hand and finger muscles. Your hands have many muscle, and like with any muscle, deep massage will break up knots, reduce pain and improve function. Try rolling a hard ball into your palm halfway through the day, or see a massage therapist for a hand massage at least twice a month. Hand massages are normally 20 to 30 minutes in length, and are a great lunch time activity. Sitting, typing and focusing on a screen a few inches below and in front of you will create slumped shoulders, unstable shoulder joints, and tight “pecs”. Naturally our shoulder blades are stable, retracted, and down. This protects our shoulders and allows full mobility. When we slump forward, our shoulder blades drift apart, jeopardizing our shoulder stability. Try to fully protract your shoulder blades by pushing your arms as far forward as possible which will spread your shoulder blades; then lift your arms up directly over your head. If you can’t do that comfortably, your shoulders are out of place. Slumping shoulders will pull the rest of your spine out of order, simply because you’ve got the combined weight of your head and upper trunk pulling down. To avoid the slump, make sure when you sit, your buttocks sits far back in the chair, and roll your shoulders one at a time back, and down. Your monitor or laptop needs to be at eye level or slightly above eye level. This will keep your head in the correct position, above your should with no tilting. Watch your head position, and try to keep the weight of your head directly above its base of support – the neck. Maintain your thoracic spine, by keeping the shoulder blades retracted; which means back and down. Eyestrain is an issue that affects anyone who looks at a computer screen all day. It has plenty of short term symptoms like dry eyes, blurred vision, headaches, and more. Adjust the monitor’s position so that is 50-80 centimeters away from your eyes, with the top of your monitor at eye level. For most of us, that means you will need to raise your monitor by using a riser, or a stack of books. An work space with too much light can create monitor glare that quickly tires your eyes. Turn off the over-head fluorescent lights and make sure that your light source is never directed behind or in front of your screen. Use indirect lighting such as a floor or desk lamp. Use the 20-20-20 rule: Every 20 minutes, find an object about 20 feet away, and stare at it for 20 seconds; this will exercise your eyes and give them a break from your monitor’s screen. Bring your own lunch to work rather than eating out; and eat your lunch somewhere other than your desk. Also bring some healthy snacks for when those pesky late afternoon cravings occur. If you work in a building that has several floors, take the stairs back & forth to your floor each day. Take at least one of your breaks outside to get some fresh air. Remember that the best thing you can do for yourself at work is to keep moving! Here are 33 cubicle aerobics, also known as Deskercise that you can easily incorporate into your work day…enjoy!! This post was written by Diversified Health Clinic, our friends just up the street at 1063 Fort Street in Victoria’s Mosaic Village. Flytographer’s Nicole Smith is our Tectorian of the Week. Nicole Smith founded her Tectoria-based startup to help match travellers with experienced local photographers all over the world. The goal? To help anyone and everyone capture amazing and memorable vacation photos. Since founding Flytographer in 2013, Nicole has gone from success to success. Flytographer has received rave reviews by newswire the Associated Press in a story that is appearing on news sites all over the web, including most recently the Chicago Herald. Why the sudden interest in a Victoria startup from America’s Second City this Christmas season? Flytographer is the perfect way to put summer vacation photos on holiday cards. A successful graduate of VIATeC’s Accelerator program for start-ups, Nicole had access to seasoned, qualified mentors who provided help in navigating areas like accounting, legal documents and expert advice in varying matters that helped her launch her successful company more quickly. But Nicole herself provides the vision, passion, and hard work that has led to the success of her company. Nicole, already a veteran of Victoria’s booming tech scene, came up with the idea while reuniting with her best friend over a weekend in Paris in 2011. After trying to take numerous “selfies” and asking strangers to capture a moment while passing by, the two met with a local friend who agreed to document their day as they explored iconic Paris streets. That weekend in Paris sparked the idea for Flytographer. Flytographer officially launched in 2013. At last count, there were over 200 photographers in 120 cities around the world available for booking. Nicole Smith and her Victoria company have been covered everywhere from the Globe and Mail to the Huffington Post, with a lot of much-need local recognition thrown in. Some other updates, on Friday, December 12, 2014 Flytographer was named to the top 10 short list for the Small Business BC Awards, for Best Concept. Our Tectorian of the Week is Sean Bennett. Sean Bennett is the facilities manager for VIATeC’s new home at Fort Tectoria, and he deserves a shout-out for all of the hard work he puts in to make sure things run smoothly for everyone. Need someone to troubleshoot elevator issues? Call Sean. Is the WiFi wonky? Call Sean. Need someone to go up on the roof to fix something in the pouring rain? Call Sean. Basically, Sean Bennett has played a key roll ensuring Fort Tectoria has been such a success since we launched on September 11, 2014. He’s the guy behind the scenes allowing the other staff to do their jobs, all with the focus of providing a launch for pad startups and tech companies who call Fort Tectoria home. What’s more amazing is that this is 20-something Sean’s first time managing an entire building. Sean just seems to have a knack for understanding how things work, or figuring it out. He’s able to take what he’s learned in one area and apply it to something in a new area that he’s not encountered before. Call him “handy”, if you will, with a common sense approach to the task at hand. Sean came to Fort Tectoria after receiving his electrician’s certificate from Camosun College, and finding a role at Point Hope Shipyards. It was at Point Hope where he learned about all sorts of construction and maintenance tasks working on some very large ships, including ships from BC Ferries and the Canadian Navy. These days, you’ll see Sean at all of the VIATeC events, from making sure the Space Bus gets to where it is needed and is setup and ready to go, to making sure Fort Tectoria is kept ship shape for the wide range of events held in the space. He’s one of the Tectorians working hard behind the scenes to make sure that it all looks easy for everyone else!